wargaming in 28 mm and sometimes smaller: Another Challenge! 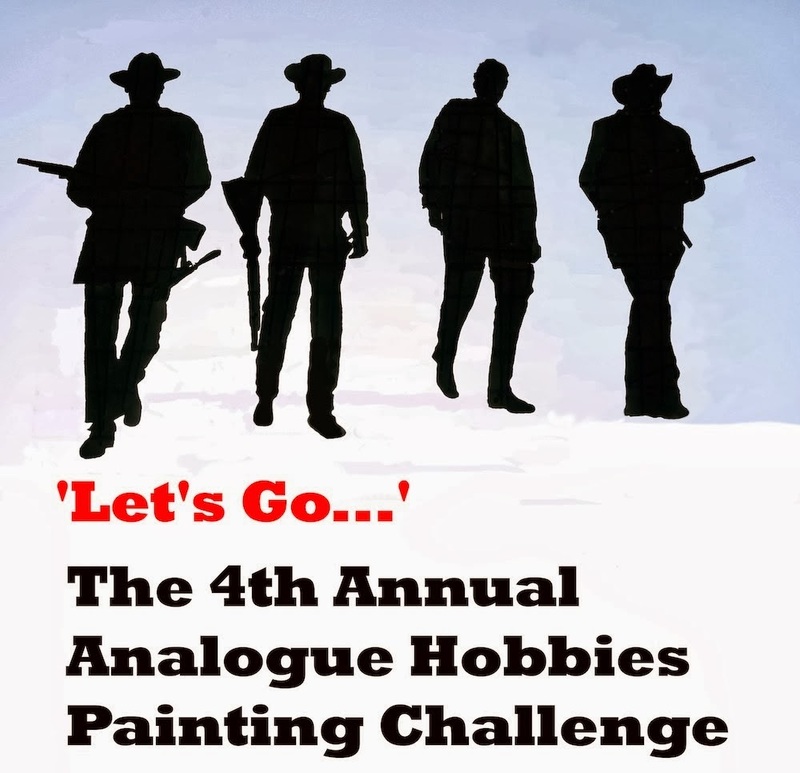 Winter of course would not be winter without the Annual Analogue Hobbies Painting Challenge. I am not really sure how Curt does it. He says he is fueled by caffeine, but I have to wonder. Last year there were 47 contestants and I believe the great majority of them made submissions. This year he has 60 contestants.........Wow! I have submitted entries each year, the scoring system changed after the first year, but for the last two years I planned 1000 and 1700 points respectively, meeting my challenge each year. This year I put in for 1500 points, but I may increase this once I have done a detailed tally of the figures. It is interesting for me to reflect back and seeing 3 years ago I painted only Napoleonics, now I am all over the place. I think probably most of the contestants use the challenge either to clean up or start a new project. I think this year I will focus on filling in some gaps, but also hope to get 1-2 new armies started. Fortunately my shift of focus to skirmish gaming has made this relatively easy. Napoleonics: Get 4-6 infantry battalions added. Probably two French, the last two Brunswick line infantry and get a start on the Quatre Bras Dutch. Add 2-3 Artillery bases and maybe work on increasing some of my cavalry units from 4-6 bases. Ancients: Continue with NKE, maybe the release of Piquet's Pulse of Battle will ignite this project. LotR: Still have the Dwarves from the Hobbit collection to do. FIW: I have just completed 300 points of Conquest Miniatures for my Muskets and Tomahawks British/Colonial force. They see action tomorrow in Montreal. I plan to add 100 more points. These are the nicest miniatures I have painted. I will post some photos next week as I have been keeping my force hidden from my adversaries. WWII: Chain of Command is by far the best game I have played, it is utterly engrossing as the command and activation systems are second to none. I plan to add Parachute and Commando sections to my British/Commonwealth force and some armour and vehicles to my Germans. SAGA/Dux: Have 8 slingers still left to do for my Anglo-Saxon war band as well as the Gall-Gaedhill swords for hire unit. WWII Winter War: One of my long term goals has been to create terrain and miniatures for a game in the snow. I am really seriously looking at the miniatures needed for the 1939-40 Winter War between the Finns and the Soviets, I plan to do this in 20mm. Very high on the list. Empire of the Dead: I am much attracted to this era. I specialized in Victorian fiction in my undergraduate English degree and for me no author matches Dickens, but Conan Doyle was always a close second. Coupled with the fact that Interview with the Vampire is one of my favourite films, makes buying and painting some of these figures increasing compelling for me. Well that is it, I have not even tried to tally the points yet, but I suspect there is 1500 points in the above list. Good luck with the challenge. It should be great fun (and a lot of painting). Thank you, good luck to you all, especially you James, was that 4500 points I saw you put in! Its always good to set targets, good luck sir. 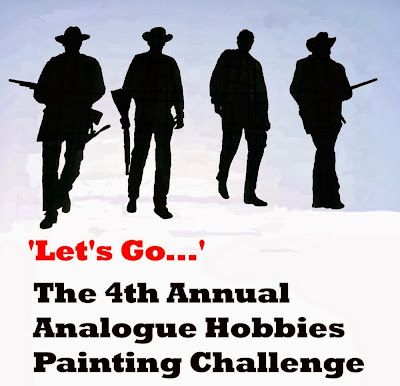 Good luck in the challenge, I'll look forward to seeing the figures painted up! It looks like you have a full plate! Good luck! You are one of the few who has taken part of every Challenge, a member of the Old Guard! I look forward to seeing a sampling from all of these projects over the next few months.